Is a cheeky chocolate your go-to snack? If, like me, you’re a chocoholic, then this is the blog post for you. Chocolate can be part of a balanced diet; as long as you choose the right kind. A healthy chocolate made from raw cacao can provide a rich source of magnesium, minerals and antioxidants and also boasts mood boosting therapeutics. To help you navigate the supermarket aisle, I’ve put together 10 healthy and guilt-free chocolate snack ideas. Enjoy! Satisfy that chocolate craving with this cheeky little bar of bliss. Free from any nasties, this bar contains only four all-natural ingredients ‘smoosh’d’ together. I really love the combination of the cashew, cacao, dates and raisins. It offers the perfect amount of sweetness and chocolate that provides a great source of energy to help you power on, making it a great pre-workout snack. My official weakness in life is the Carob Kitchen Banjo Bear. This delicious – and adorable – bear is your healthy alternative to the chocolate frog and is caffeine, sugar and gluten free. Carob is a natural ingredient that is super-sweet and rich in both B vitamins and minerals. Stash this bear away in your handbag, desk or kid’s lunch box for a sweet treat. If you love a good chocolate spread, get your hands on a jar of this bad boy! Packed with an abundance of natural ingredients, it’s so good you can eat it by the spoonful. Common supermarket spreads are often filled with added sugar, salt, dairy and oil. However, this super spread contains only nuts, seeds, cacao and vanilla. 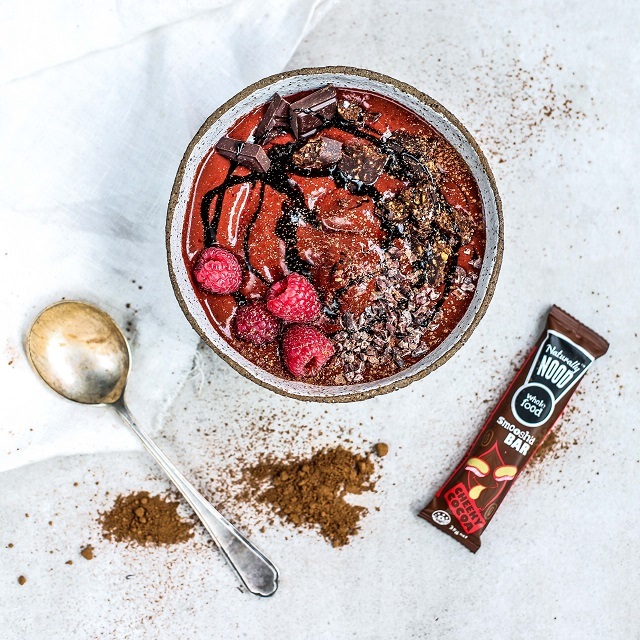 A guilt-free chocolate spread; this really is heaven in a jar! This bliss ball mix is a healthy – and delicious – alternative to packet cake mixes. The Fit Foodie has formulated a mix that is not only free from sugar, artificial ingredients and sweeteners but also tastes amazing. I especially love that this mix is free from dates and is FODMAP friendly! Make a batch of balls up at the beginning of the week, or create these sweet treats with the kiddies! There are few things that could make me happier than a chocolate that tastes wonderful as well as having healing benefits for your gut. This wellness jelly is simply genius. Containing nutritious gelatin – also found in bone stock broth – this jelly will nourish your digestive system and tummy. A refreshing chocolate treat, this wellness jelly is also gluten, dairy and sugar free. Loving Earth has done it again by turning a regular chocolate coated nut into something extraordinary. Crunchy and activated almonds are covered in a layer of raw chocolate and caramel – simply delicious. This chocolate snack ticks all the boxes; vegan, gluten and sugar free, and is also fair trade. My only complaint: it’s hard to stop at a few. Dark chocolate lovers rejoice! This bar will satisfy all your chocolate cravings in one. Made from certified organic and raw ingredients, this bar will boost your mood and send your taste buds soaring with just one bite! The entire Pana range is handmade with love and makes for a seriously wholesome chocolate treat. However, the bar has a rich and strong bitter taste to it that may not appeal to those with a sweet tooth. I think I may well have eaten my body weight in these bars. The Triple C contains star ingredients cacao nibs, cashew nuts and coconut. This is the perfect paleo snack for those who like a hint of chocolate but not too much. It blends wholefood ingredients into a sweet and bitter bar of deliciousness and is free from any nasties. Super filling, this bar offers the perfect 3pm pick me up. Swap your cheeky hot chocolate habit with Kkao & Co tea with a dash of milk. Made from the husk of the cacao bean this tea provides a delicate and delightful chocolate experience, without the guilt. Naturally free from gluten, sugar and preservative this loose-leaf cacao husk will warm you up from the inside out and give you that healthy chocolate hit. Definitely a pantry staple during those winter months. Get creative and whip up your own chocolate and nut trail mix. I always aim to combine a variety of at least four different nuts and seeds. Individual nuts and seeds might not contain every amino acid to make a complete protein, but when you combine then you can ensure adequate nutrition. My favourite combination is coconut flakes, sunflower seeds, cacao nibs, almonds and cashews.